If you have followed any of our work in the past, you know that Jake and I are passionate about open-source work. Check out our GitHubs (klinker24 and klinker41) and it is pretty clear! Everyone's background and experience is different, and like blogging, open-source work is the perfect way to give back to the Android community and share some of your unique experience. If we make a component in one of our apps that can be re-used, we open-source it! That is just the way we have always done things. If we make a component in one of our apps that can be re-used, we open-source it! When I started to make the Android Wear 2.0 app for Pulse, I saw an open-source opportunity again, in the form of text input. With Android Wear 2.0, Google decided to allow users to input text via the keyboard. I think that is a great decision, considering how funny people look, when talking into their watches. 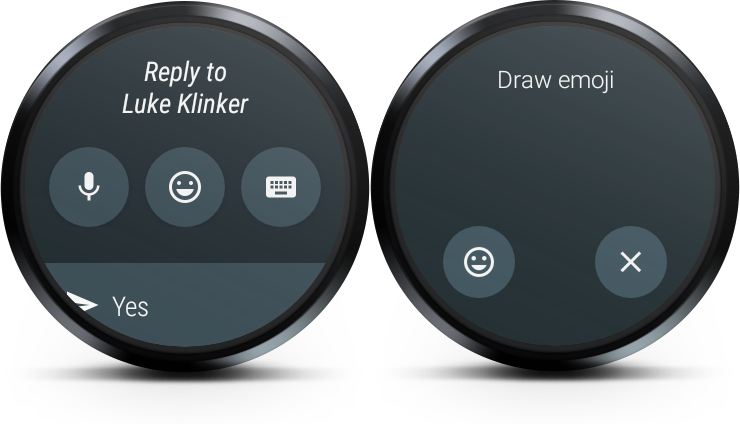 Notification reply options for Android Wear 2.0. The library allows for quick and easy text input, whether that is from your voice, a keyboard, or canned responses. The missing API is now available! The missing API is now available! If you omit the String or the array resource, the WearableReplyActivity will display the default canned responses: "Yes", "No", "Maybe", "Ok", and "Thanks". If you are making an app for Android Wear 2.0, you now have an easy text input method! Don't worry about trying to shove an EditText on the tiny screen, or implementing this stuff yourself. Before making the library, I did consider the possibility that Google had an implicit Intent sitting out there, that I could have plugged into, but there is no guarantee that that would always be around, or that it would work the same for everyone, so I decided to implement it myself instead. I would love to improve the layout of the library, to closer resemble Android Wear 2.0's notification reply layout. This will probably come with time, but for now, it is clean, easy to look at, and simple to understand. A countdown timer for voice replies, so the user can see what they spoke, and choose to cancel it. Let me know if there is anything else you would like to see out of this library, or if you plan on using it in your Android Wear 2.0 app!